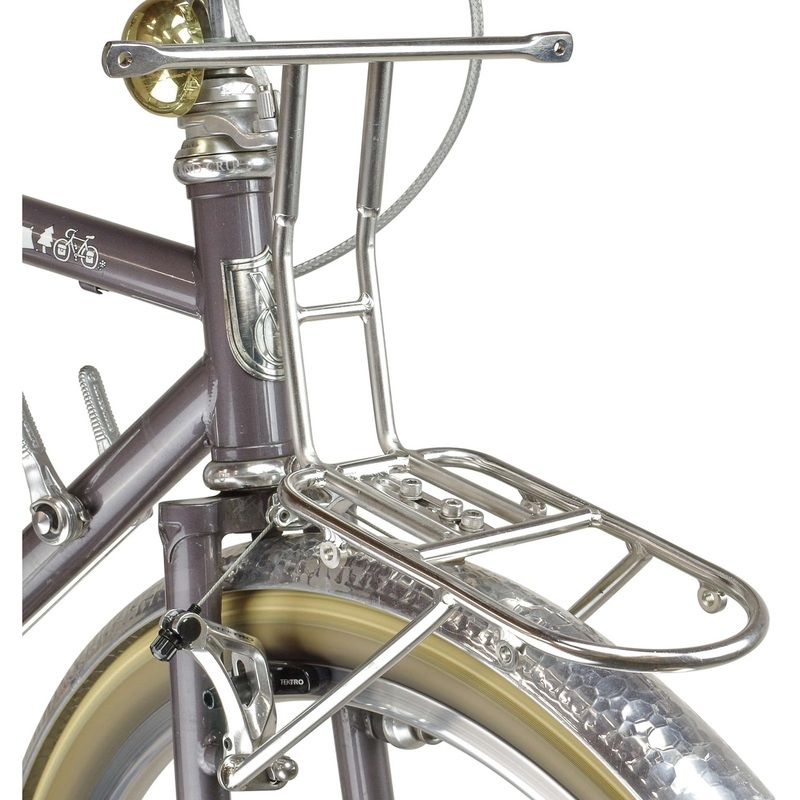 The Velo ORANGE Blog: Decaleurs: What Are They and What Do They Do? So what exactly is this thing and why does it play an integral part of mounting Randonneur Handlebar Bags? Well, a decaleur (deck-ah-lure) is part of an overall system that is designed to prevent a handlebar bag from flopping around. The idea is that the bag would rest all of its weight on the front rack while the decaleur exists to support/affix the top portion of the bag to prevent it from tipping off the side of the rack. 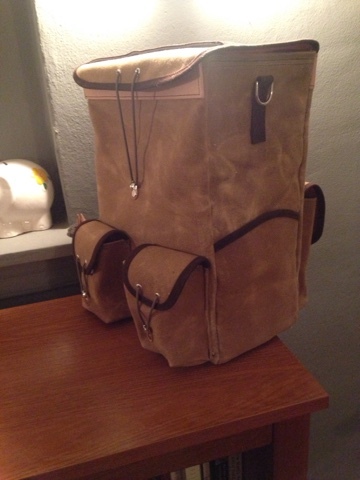 One of the misconceptions of a decaleur system is that the decaleur is there to support the weight of the bag. That is not the case, that is the rack's job. I want to stress this. The rack supports the load, not the decaleur. There are two parts of the decaleur system: the receiver and the bag mount. 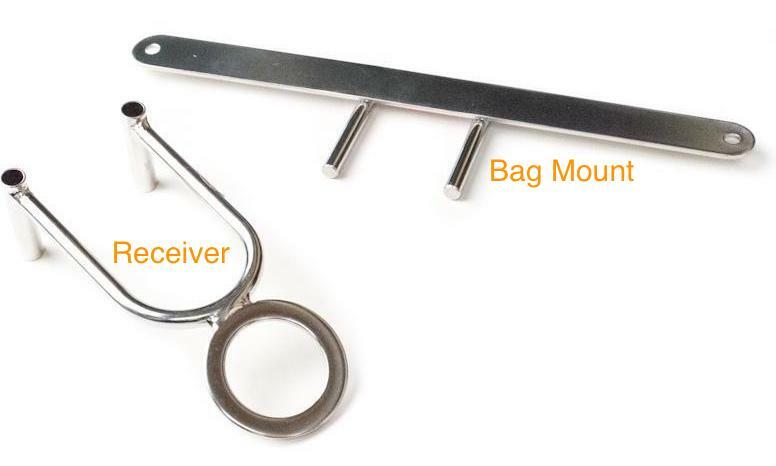 The receiver is most often mounted to the stem or headset and the bag mount is bolted directly to the back (facing the rider) of the bag. This makes for an effective and easy to use quick release system for securing the bag while also having the ability to quickly remove the bag from the rack to enter a restaurant, cafe, or office. 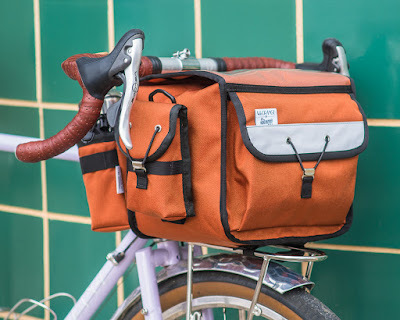 While the likelihood of a bag bouncing out of the receiver is extremely low, we suggest using a toe strap or the integrated strap that goes along with our Randonneur Handlebar Bag to secure the bottom of the bag to the rack. An alternative to the separate rack and receiver is a system where the decaleur is a part of the rack: the "Integrated Decaleur". This is our preferred system as it provides a stronger, simpler, and lighter system than a separate decaleur and rack system. 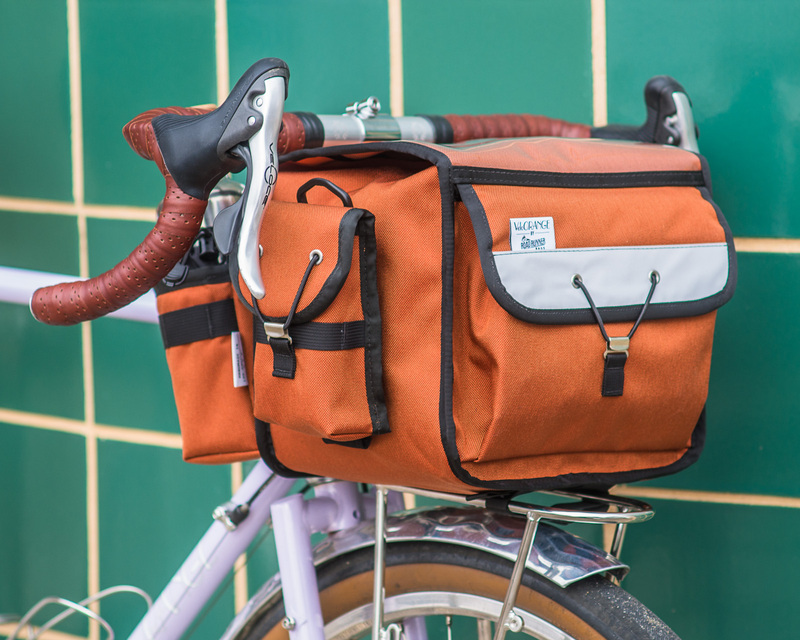 The integrated system is best for medium to large handlebar bags like our Randonneur Bag. 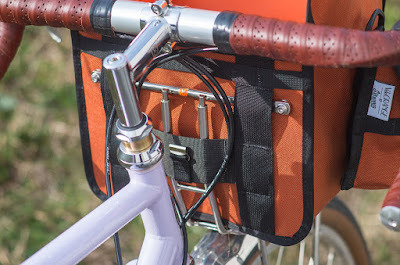 Note that our handlebar bag has pre-installed grommets so you don't need to drill, punch, or use a soldering iron on your new, fancy handlebar buddy. We have these available for cantilever brake studs (which also works with V or linear pull brakes) as well as braze-on styles (which also includes p-clamps for forks without rack mounts). There are two other benefits of the Integrated Decaleur system: 1) it creates a standardized distance from the rack to the bag mount, thus making mounting and installing a medium/large handlebar bag a total cinch - just bolt the bag mount on the bag and slide the bag mount into the receiver. 2) it eliminates the potential issue of small frames not being able to take handlebar bags. So! All decaleurs and parts have been put back into stock and are ready to receive your Rando Bags! Hi there. I have a VO decaleur and an Ostrich handlebar bag (F104) waiting to go on my new build. It seems like this is a pretty common combo but I have a question that I've not seen anyone address online. When drilling the bag for the decaleur, do I drill into the metal stiffening bar that is built into the bag thus bolting the decaleur and the stiffening bar together, or do I attach it above/below the stiffening bar? That depends on the ultimate position of the decaleur in relation to the metal stiffener. I'd mock it up and see where it lies. I imagine the bar is probably aluminum? If that's the case it'll be a lot easier to drill through than steel. Obviously connecting it by the metal bar would be the most secure, but I have found thick leather seems to be fine as well.